By popular demand — Judy Moody's brother, Stink, gets his chance to star! Every morning, Judy Moody measures Stink and it's always the same: three feet, eight inches tall. Stink feels like even the class newt is growing faster than he is. Then, one day, the ruler reads — can it be? — three feet, seven and three quarters inches! Is Stink shrinking? He tries everything to look like he’s growing, but wearing up-and-down stripes and spiking his hair aren't fooling anyone into thinking he's taller. If only he could ask James Madison — Stink's hero, and the shortest person ever to serve as president of the United States. Megan McDonald is the author of the popular and award-winning series starring Judy Moody. She says, "Once, while I was visiting a class full of Judy Moody readers, the kids, many with spiked hair à la Judy's little brother, chanted, 'Stink! Stink! Stink! Stink! Stink!' as I entered the room. In that moment, I knew that Stink had to have a book all his own." Peter H. Reynolds is the illustrator of all the Judy Moody books. He says, "I've fallen in love with the whole cast of characters in the world of Judy Moody, but Stink has always been a favorite of mine. He reminds me of myself growing up: dealing with a sister prone to teasing and bossing around — and having to get creative in order to stand tall beside her." Delightful full-page and spot-art cartoons and playful language in large type bring the child's adventures to life. 'Things are definitely looking up, up, UP' with this bright addition to beginning chapter-book collections. This spirited launch of a new series focuses on Judy Moody's younger brother, Stink. . . . McDonald's breezy narrative and likable character will keep Judy's followers amply amused and recruit new fans. The narrative is fun and laced with puns-from Mr. Trashmore to "newt in shining armor," and it's peppered with black-and-white illustrations, including comics reflecting Stink's triumphant fantasies. A fine fare for fledgling chapter-book readers. Stink definitely measures up to his memorable sister. 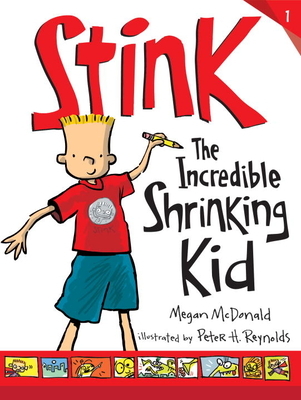 Readers of Judy Moody who requested that Stink have a book of his own will not be disappointed. James Madison, the shortest U.S. president, becomes the hero of a kid worried about getting shorter. A humorous look at the emotional trauma a second-grader experiences at the thought of growing smaller, rather than growing taller. A welcome arrival for this age group. Judy Moody lovers (and their little brothers) will adore her younger brother, Stink. Stink' — the quirky kid brother for whom fans of the Judy Moody series have long harbored a soft spot — now has a series of his own.